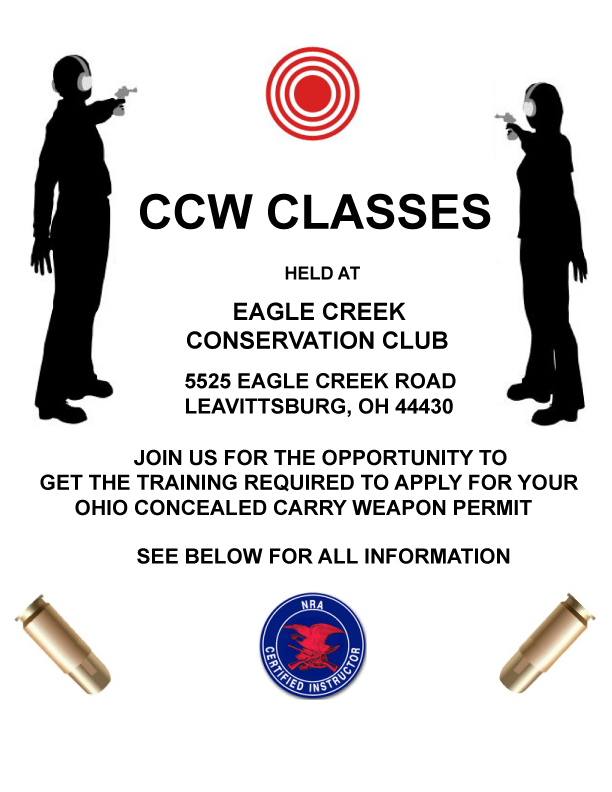 Eagle Creek Conservation Club is holding NRA Pistol/Ohio Concealed Carry Classes on the dates listed below. Classes are held on Friday evenings (5:30pm to 8:30pm) and Saturdays (9am to 6pm). If we are unable to complete the 2 hour range portion of class due to weather or other circumstances, range time will be scheduled at a convenient time for each student. If you are interested in taking the course to apply for an Ohio CCW permit, Ohio law requires that you take the NRA Basic Pistol class consisting of 10 classroom hours PLUS an additional 2 HOURS of range time and live fire activities. Our class meets and exceeds both these requirements. If you have a particular handgun that you would like to bring to class, please let me know when you register. We use .22 caliber target pistols for the range portion of class, but you are welcome to bring any pistol that you already own or are considering for your concealed carry weapon. Please make sure that the pistol is unloaded and transported to class according to Ohio laws. (NO LIVE AMMUNITION OR LOADED GUNS ARE PERMITTED IN THE CLASSROOM!) If you do not already own a .22 caliber target pistol, please wait until after the class to purchase one. We discuss the many factors involved in purchasing the right pistol. There is no additional charge to use one of my target pistols for the range. There is an additional charge of $5.00 per 100 rounds of ammo if you do not have your own .22 caliber target pistol to use. Targets, hearing and eye protection are also provided at no additional charge for the range time. I provide electronic hearing protection so students can hear me on the range, yet the electronic hearing protection blocks the sound of the gun shots. You will receive an NRA Basic Pistol Handbook, an Ohio CCW Booklet, an application to apply for your Ohio CCW permit and the paperwork and certificates necessary to apply after successfully completing the classroom and range portion of the class. The Eagle Creek Conservation Club is located at 5525 Eagle Creek Rd. Leavittsburg, OH. Please let me know if you need directions or if you have any questions about the class, I’d be happy to help! Thank you for your interest, and I look forward to meeting you in class.